This document contains installation instructions for the AquaMon Pump Control Node,CHA50007XBSG. 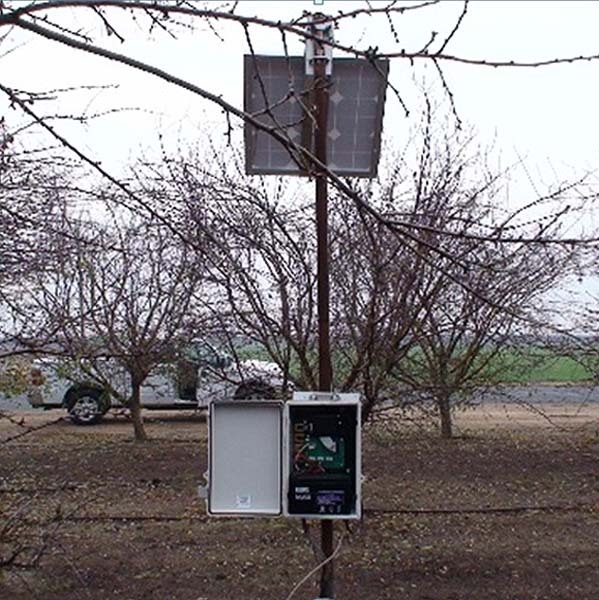 This system permits the grower to remotely monitor and control an installed irrigation system. Power is supplied to the CHB50007XBSG from an internal 12 Volt battery. Battery charge is maintained by an included solar panel and charging circuit. The AquaMon pump Control Node permits the grower to monitor line pressures and control irrigation pumps through the RSVP software running on Cermetek’s secure web server. The grower can access the server at any time using any browser equipped, laptop, tablet, smart phone or desktop computer. Hardware for mounting the AquaMon Node and Solar panel to a user provided pole. Standard (or pole) to which GSM RF Cell Radio Base Station is to be attached. Cermetek recommends using a pole with a 1 3/8 inch OD. The CHB5000AGWL System is web based. All system supported activities and functions are designed to be performed via the Internet. Typical functions/activities such as establishing/modifying Alarm Set Point Limits as well as viewing archived data is accomplished over the Internet by utilizing the Remote Sensor Viewing Platform (RSVP) software. A subscription to Cermetek’s Web Based Data Hosting Services is required for access to internet related services. The RSVP web based application accessed from any hardware platform running a commercially available browser. Among the browsers supported by the RSVP software are such widely used products as: Internet Explorer™, Safari™, FireFox™, Mozilla™, Opera™, and Google Chrome™. The pump control node simultaneously communicates with the Internet via an established cell. The picture figure below shows the hardware components installed in the pump control node. Installation of the Base Station requires physical connection of the node and solar panel to the user supplied pole using the hardware mounting brackets are supplied by Cermetek. Internet Registration is automatic once power is provided to the Base Station. No external connections are required. Follow the step-by-step procedure outlined below to attach the Base Station, the Solar Panel and the Soil Moisture Sensors. Cermetek STRONGLY recommends anchoring the standard pole in cement to insure proper stability. Install the USER SUPPLIED standard (pole) to which the pump control node is to be attached per the instructions provided by the standard manufacturer. Ensure that the standard is securely anchored in the ground. A minimum depth of 2 feet is recommended. Attach pump control node enclosure to the standard (pole) 3 to 5 feet off the ground using the hardware provided. 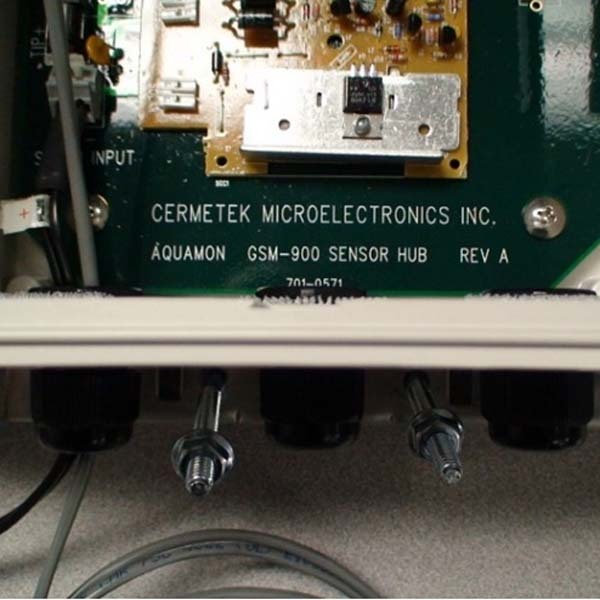 The USER SUPPLIED sensors and solenoids are connected to the pump control node using separate terminals and dedicated connectors located inside the Base Station enclosure. 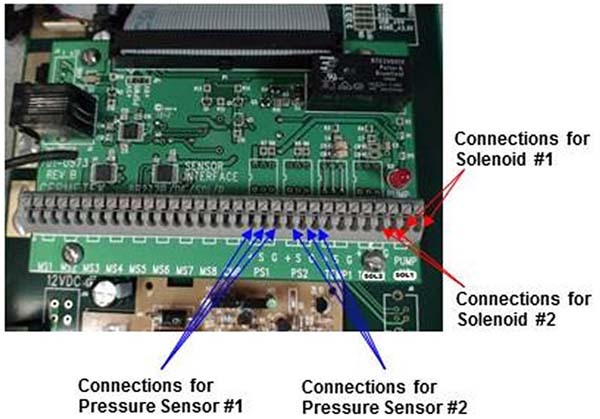 * The USER SUPPLIED sensors and solenoids are connected to the pump control node using separate terminals and dedicated connectors located inside the Base Station enclosure. * It is necessary to connect all sensors to the pump control node unit PRIOR to connecting power. 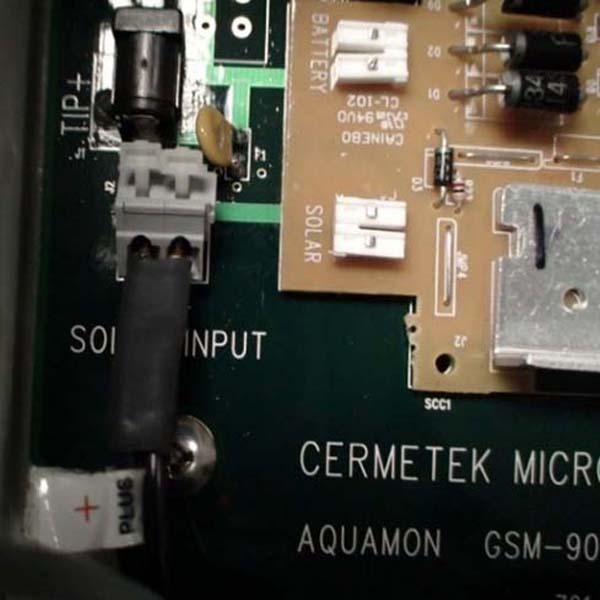 Before connecting the Water Level Sensor to the Base Station, guide the Water Level Sensor cable thru the gland on the left side of the enclosure. Connect the Battery Cable to Connector J1 (labeled TIP+) on the Mother Board BEFORE connecting the battery cable to the battery, see below. Note that the Battery Cable has POSITIVE TIP voltage. Connect the Battery Cable to Connector J1 on the Mother Board PRIOR to connecting the Battery Cable to the Terminals of the Battery. Failure to follow this precaution may cause damage to the Sensor I/O Board, may damage the Base Station Mother Board and/or may cause injury to personnel performing this installation. 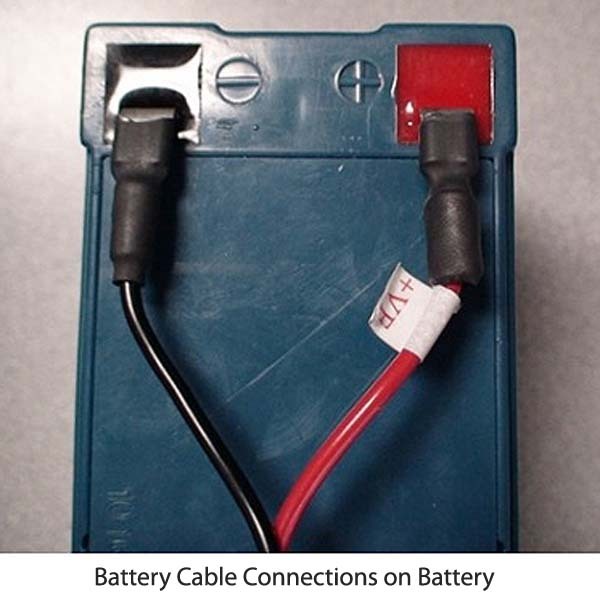 Connect Battery Cable to Battery as indicated below. See Figure 10B. Mount Battery on Velcro tape located on inside bottom of Base Station Enclosure. Connect the Solar Panel to the Pump Control Node by guiding the Solar Panel cable thru the left most gland in the enclosure, see photos below. 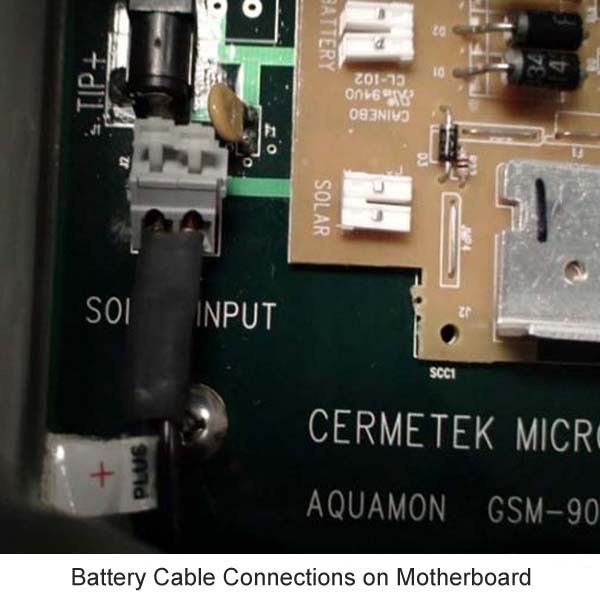 Connect the Solar Panel cable to Connector J2 (Labeled SOLAR INPUT) on the Mother Board. The Remote Sensor Viewing Platform (RSVP) Software is used to access Cermetek’s Web Based device control, sensor monitoring and data display and archival network. The RSVP software is a web based application. It is accessed from any PC or MAC hardware platform running a commercially supplied web browser. No installation is required. However, a subscription to Cermetek’s Web Based Data Hosting Services is required for access. Cermetek will provide the user with an initial Login USERNAME and PASSWORD. The user may change the PASSWORD at any time once the user has successfully logged onto the RSVP web site. Follow the step-by-step procedure below to access the RSVP Web site from any browser equipped tablet, smart phone or computer. 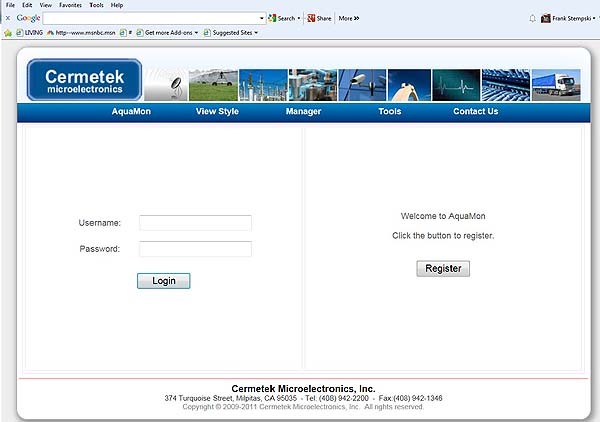 Type the Cermetek supplied USERNAME and PASSWORD in the Web Site LOGIN screen (see Figure 11), when displayed. The purchaser/installer/user of the CHB5000AGWL System Installation Guide: Wireless Monitoring Network containing a GSM RF Cell Radio, Water Level Monitor and AC/DC Power Supply product and the RSVP Web Site agrees to indemnify, defend, and hold harmless Cermetek Microelectronics, INC, its affiliate and their respective owners, investors, contractors, officers, directors, members, managers, partners, shareholders, licensors, suppliers, customers, employees, agents, third-party advertisers, technology providers and service providers from and against any loss, damage, cost, or liability (including reasonable attorneys' fees) resulting from or relating in any way to a third-party claim, demand, action or proceeding that arises out of the installation or use of CHB5000AGWL product, including but not limited to in relation to your use, non-use or misuse of, or connection to the CHB5000AGWL product, the RSVP Software Services and any Content (including without limitation your Content and any third party Content) forming part of the RSVP site.